The Imaging USA photography conference opens in San Antonio, Texas on January 5th, and a few of us from Photofocus will be there, so let’s photowalk! 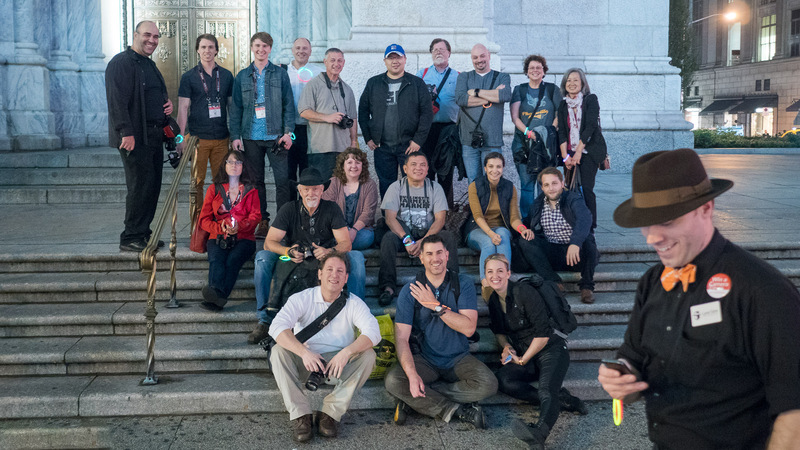 A photowalk is a gathering of photographers making pictures, learning new skills, and making new friends. It’s are a powerful way to practice and have some fun and it’ll be a good start to your photographic year. Pictures in this post are all from our photowalk in New York, recently. Meet at the Henry B. Gonzalez Convention Center on Market Street where there’s a drop-off in front of the convention center. Here’s a link to the spot on Google Maps. We’ll make pictures along the River Walk; long exposures, street portraits, cityscapes, etc. A camera of any kind. Most importantly, bring a fresh memory card and fresh batteries. Also, we’ll likely be doing long exposures and it might be chilly so bring extra batteries because both of these situations drain batteries more quickly. Dress for the weather because we’ll be walking rain or shine, warm or cold. I’d also recommend a tripod or Platypod (I’ll bring both). Otherwise, don’t burden yourself with too much gear. If I had to choose one lens for nighttime cityscapes, it’d be something wide and bright. A second lens might be a 50mm. It’d be great to see you. We’ll have fun, and we’ll probably even have some prizes from our sponsors to share.